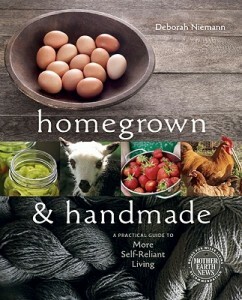 Home » Homemade Living » Green Planet » Homegrown & Handmade GIVEAWAY! While reading through a local magazine the other week I came across a review of “Homegrown & Handmade,” a book written by Deborah Niemann. Because she is a local Illinois woman who left the urban jungle in search of the country life, I was instantly intrigued. This is my new favorite book for so many reasons. Not only does the author offer quaint recipes like caramel apple butter, castile soap and homemade cheese, but she thoughtfully outlines how and why she lives the homesteading lifestyle. Her encouraging words don’t intimidate the reader; rather, she kindly reminds us that mistakes will be made on the path towards more sustainable and self-reliant living. In many ways, it is a user’s manual for living a simpler, healthier and more thoughtful life. A perfect fit for the mission of Homemade Mothering. For a city girl like me, this country-living manifesto is a simple pleasure to read. What is your favorite thing to make at home? Contest ends Friday, October 28 at 11:59 pm CST. My favorite thing I make at home is ALL of my sons foods. All organic, all local or homegrown if possible since his first foods. No jar babyfood, ever. I love to know exactly what my little one eats! My favorite thing to make is a quilt…or marinara :). I will definitely be picking up this book…looks beautiful and inspiring! My favorite thing to make at home is bread. I love fresh baked bread. It might not last as long but the taste cannot be matched. We love it here! Thanks for posting about this book! I have heard good things about it! I make all of my children’s food. It began about 3 years ago with the simple goal of helping my preemie son (born 10 weeks early and only 2.5 pounds) gain weight healthily once he could eat solid foods; but has since developed into a passion (my second son is a Buddah!) for only putting the best foods in the bodies of my family! I strive for homemade, and as natural as I can possibly get and love inspiring others with the easy, cost-effective, and healthy foods I make! I love to bake- cookies, breads, cakes- mmmm 🙂 This book sounds fabulous, thanks for the chance. I love to make pizza dough, and brownies. I also make my own cleaning supplies, and laundry soap. This books looks great. Would love to read! I love knitting hats and scarves. I am looking forward to teaching myself to make a sweater for my daughter very soon. this time of year, apple crisp and halloween costumes! I love to make my own lotions and room spray using essential oils! Lavender Spearmint is a favorite of mine. The only thing i can make is baby food! I wish i was more self reliant! Some treatments for aches and pains, we have an aloe vera plant and that goes a long way! I came across a pizza sauce recipe from Country Living and made it last week. Not only does it make the whole house smell divine as you roast the onions, tomatoes and peppers, but it tastes amazing. It will now be in my biweekly cooking rotation. Can you please share it with us? Love cooking good, wholesome meals for us and our baby, and I also mostly give homemade gifts for weddings and babies. I actually just tried your recipe for making my own detergent and I’m hooked. I want to make everything and anything I can @ home. I have a 14 month old little boy that makes me want to make the world a healthy safe place for him to live. I love making gifts for friends and family and especially brand-new-babies. And sea salt caramels. But those are dangerously addicting so I need an excuse to share or I’ll be in big trouble. This book looks like just the thing I need to read right now! Oh la la! Can you share your recipe for sea salt caramels???? 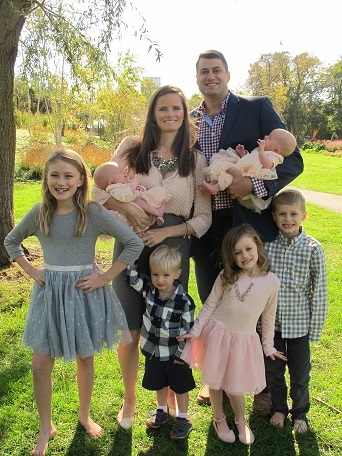 I would say baked goods like muffins and banana bread and everything my wife makes – she makes awesome homemade pizza that our son loves and recently started making her own laundry detergent for her family – I have an aspiring homemade mother who takes great care of her family! I love making my daughters food. She is 8 months old and it is fun introducing her to new foods. I make my own sunscreen and lotion to insure there are no nasty chemicals. I used the sunscreen on my girls all summer and they did not get one sunburn! I have to say food, but more specifically bread and other baked goods! Baked goods! My latest obsession is granola. I love making food for my 2 year old daughter, too. At this point almost all of our produce is coming from our small green house or yard. What I love making MOST are puzzles and simple toys for my daughter with a scroll saw. The idea of a scroll saw may be intimidating, they’re really not too difficult to get the hang of, though, and the possibilities of creativity are endless. My mother-in-law used to transfer my husbands drawings on re-used fabric and make them into dolls, we still have an astronaut of his from when he was 5. That was an inspiration. As of now I am creating very simple puzzles, with simple cuts and pieces… I hope to make some of her drawings in the years to come. I also love doing this with project scraps/re-purposed wood. Indian food since it gives me lots of choices for “meat free” meals! Chicken Noodle soup and applesauce! The fall weather is perfect for both! I love making my own cleaning supplies. It’s a great way to avoid chemical headaches, and you can start your kids cleaning when they are young because the danger is removed! This book is on my Christmas list – I love the concept. My favorite things (yes – too many to count!!!) are handspinning, Goat Milk soaps and cheeses from our small herd of milking Nigerians. I love making anything with pumpkin this time of the year and potato dumplings!! I love making homemade meals for my family & our lotions, soaps, deodorant and I’m getting ready to embark on a new venture; simple medicines & perfume! I love to make homemade sauce for cooler days from all the great summer tomatoes! My favorite thing to make is bread. I would like to learn to make sprouted sourdough types; that’s my goal. I have been to a goat class of Deborah’s and my grandson and I learned a lot. I love making soups. There is such variety, but it is usually very simple to pull together a comforting soup. I am also looking forward to making my daughter’s baby food in a couple of months. I cook almost all our meals at home, but one of my favorite things to make is soup. Variations of butternut squash soup are a favorite in our house! We love making homemade yogurt! Our boys love it. My mother’s homemade French bread. It has to be everyone’s favorite. No butter necessary, it just melts in your mouth! Food! Evertything tastes better homemade! Handknits! For me, my family, friends, and charity. My favorite thing to make at home would have to be peanut butter. I learned from you the simple way to make your own. We go through it like water! It’s so delicious and I love knowing that it’s only made from peanuts. Making things things at home makes life so much easier, you know exactly how it was made and what went into making it. Cooking with only fresh ingredients usually grown in my garden (never buying food with preservatives), Bread and other types of muffins. Fruit smoothies for the boys. But by far my favorite thing is to recycle material from old clothing that friends and family no longer want. I like to make anything from new clothing (out of material from the donated or not used any longer pieces) to things such as curtains, and pillows out of the material which has been taken apart. I would like to move into the making of soaps and lotions which I have dabbled with from time to time. Also next season I will start to focus on herbs in my garden for cooking, soaps, medicine, and lotions. Any recipes welcome! I love to make baby food for my babies when they are small. I would have to say that not much tops the smell of fresh basil and ripe cherry tomatoes that permeates the kitchen after a trip to farmers market – Pesto production time! Easy Beeswax Hand Lotion and soap are my favorites. I would honestly have to answer caramel frappes…sure wish that I had never learned how to make these insanely delicious things, lol. What a great giveaway! My favorite thing to make at home is kombucha! I got a starter culture from a friend and now we’re fermenting like mad! I’m really enjoying making bread and pizza dough. My favorite thing to make at home are simple baby food & yummy meals with fruits/veggies/meats we grew or harvested! I like making homemade applesauce. The epitome of fall! I love making my daughter’s meals from fresh food every day! I love making pancakes and muffins. I want to branch out but sometimes feel so busy!I sometimes make my own cleaning products and air freshener. Soup and bread!! Those are my favorites!! My favorite thing to make at home is homemade pizza! Tastes so good!! My favorite thing to make right now is pumpkin bread and pumpkin whoopie pies. So yummy! Now that Halloween costumes are ready (a platypus and a ghost-fairy), my girls & I have been making uglydolls out of felted sweaters. They draw out their ideas, search through our sewing treasures, and bring them to life. I love that they’d rather do this than buy something new! I love making meals from our local co-op and farmers markets…. I have made all my son’s food from the first solid he tried… It is such a joy to watch him try new things and hopefully LOVE them!! I have started making my own cleaning products and using way less paper products… As I make the shift, I am definitely intrigued by all the ideas this book has to offer! We make everything from scratch around here. You won’t find pancake mix, cookie dough in a tube, or condensed soup at my house! I love knowing what is in the food we eat and love that we are skipping all the packaging waste. I love making my own cleaner. Also, I enjoy making my son gluten and dairy free muffins. The easiest thing I make is breast milk. 😉 I also like to appliqué onsies. I love making jam out of fresh local fruit. I am so excited about this book! Love to make breads! Everyone loves it, the house smells great and I feel accomplished. My teenager and his friends love to snack on fresh bread dipped in olive oil and cheese. Does anyone know when the winner is announced? Congratulations to fellow Homemade Mother Emily from South Bend, IN – she won the copy of “Homegrown and Handmade” – stay tuned for more fun *giveaways* in the coming weeks! My favorite thing to make at home is vintage family homemade cookbooks for my family members. My twin sister and baby sister and I come together and use fresh foods from our gardens, try out new recipes and if they make it by all our kids and husbands – there in the book. It brings homegrown, homemade and family together! We love a simple life with your loved ones. I enjoy making milk kefir with fantastic Raw Milk (ooops pet food in Florida). Kefir is a great addition to so many dishes.